Trying to grow grass in the Texas heat isn’t easy, especially with water restrictions during the drought. 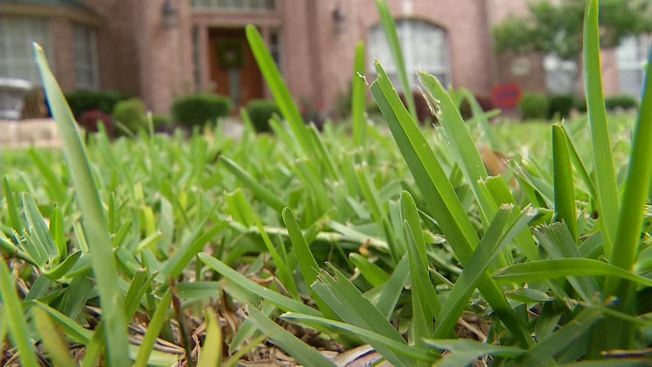 But not growing grass can prove costly for homeowners who are fined by their homeowners association for not keeping up a yard. Carolyn Regan said she is planting grass at her home for the second straight year. “It started a little bit two years ago and last year we didn’t have any grass out here. So we had it all replaced and this is what’s left of what we replaced last year,” Regan said. Plano, where Regan lives, has been under a Stage 3 water restrictions for several months. This means homeowners can water their yard once every other week with a sprinkler system and for up to two hours a day by hand. James Watt from DFW Sod and Tree Trimming Co. said he gets hundreds of calls every week for people who need their grass replaced. Watt said to give the grass a better chance this year, his company is putting down gel water beads at the root of the grass. Those are supposed to hold water longer and keep the grass wet. Regan said they personally want their yard to look nice, but they also know that if they don’t keep it up they would get notified by their HOA. So they are willing to pay thousands up front to avoid a penalty fee down the road. Plano city officials said they expect to be under Stage 3 water restrictions for the rest of the year.